YC-217 type C adapter has come as the most integrated multifunctional type-c adapter out there. 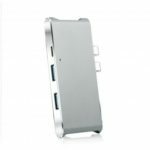 It takes everything you want into consideration including 2 USB 3.0 ports, 1 USB 2.0 port, HDMI, RJ45, SD/TF card slot and USB-C power delivery port. Actually one hub for all possible accessories. Allows you to mirror or extend your screen with the USB-C hub, directly stream 4K*2K ultra HD AV sources at up to 60Hz refresh rate to ultra high definition TV. 2 super speed USB 3.0 ports support max. 5Gbps data transferring rate. 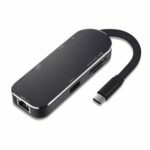 Allows you to connect keyboard, mouse, USB Ethernet adapter, flash drive, etc. 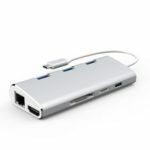 The USB type C hub adapter supports 1000M Gigabit RJ45 Ethernet port, backward compatible with 100M/10M RJ45 LAN. Support SD/SDHC/SDXC, SD 3.0 UHS-1, up to 95MB/s (SD slot and Micro SD card slot can be used simultaneously). 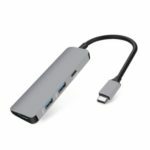 USB-C power delivery for MacBook, ChromeBook Pixel and other USB-C devices based on PD charging protocol, capable of simultaneously transferring data and charging devices. Perfect as a holder stand for tablet or cellphone, helping saving space while charging. 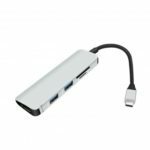 Works perfectly for new MacBook, MacBook Pro 2017 2016, Google ChromBook, Huawei MateBook and more.